One sounds like a nuclear plant disaster, the other recalls a villainous organization from James Bond movies. They’re actually cybersecurity attacks that exploit vulnerabilities affecting almost anything that contains a computer chip. The issue was discovered shortly after the New Year, when security researchers discovered critical security flaws. As WIRED reported, “A bug in Intel chips allows low-privilege processes to access memory in the computer’s kernel, the machine’s most privileged inner sanctum. Theoretical attacks that exploit that bug, based on quirks in features Intel has implemented for faster processing, could allow malicious software to spy deeply into other processes and data on the target computer or smartphone. And on multi-user machines, like the servers run by Google Cloud Services or Amazon Web Services, they could even allow hackers to break out of one user’s process, and instead snoop on other processes running on the same shared server. 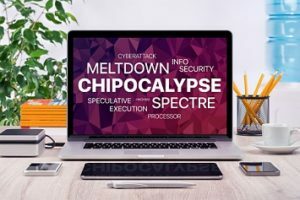 While the two attacks operate on the same principles, there are subtle differences between them—while Meltdown makes it possible for malware to gain higher-privilege access to a computer’s memory, Spectre steals data from other applications’ memory on a computer. Meltdown appears to be limited to Intel chips; Spectre attacks not only Intel processors but also chips from AMD and ARM. Such a wide-ranging cybersecurity flaw isn’t easy to fix, and many outlets have described the response to the situation as nothing short of a train wreck, and a lot of the heat has come down on Intel in particular. However, other companies such as Microsoft have not emerged unscathed, as Microsoft’s attempted chip fix bricked some PCs. So how can you protect your devices and the devices of those in your workplace? CNET is keeping a running tab of fixes as they become available, covering everything from Android and iOS mobile systems to PCs, Macs, and various web browsers.